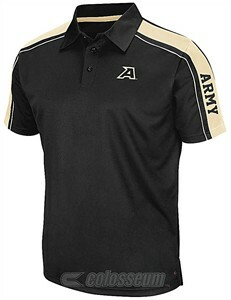 Chiliwear has been making great College Golf Shirts for years and the Army Black Knights Mens Condor Polo Shirt is no exception with its regular-fit 4.4 oz. 100% Rival Polyester body that should give you seasons of wear. Constructed with your comfort in mind this Polo shirt can go to the golf course, the big game, or anywhere you want so you can show off your Black Knights pride with its team color Black body, embroidered left chest and left sleeve team logos, and the school secondary colors on the shoulders.